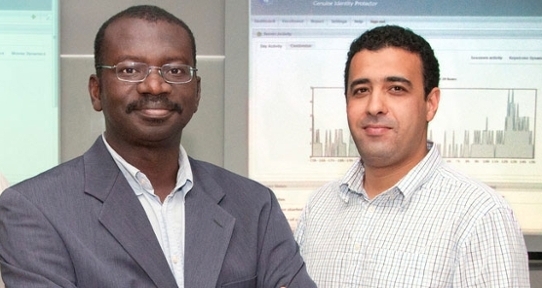 US patent provides network security - UVic IP announced US patent approval of technology created by Dr. Issa Traore (electrical and computer engineering; pictured left) and his former PhD student A.A. Ahmed that allows computer behaviour to be monitored in a way that it can tell whether the person using it is authorized or not. Pictured right: Dr. Youssef Nakkabi, senior scientist and programmer at Plurilock. Researcher videos - A collection of videos featuring faculty members and their research. Interests - A list of faculty research interests. Areas - A list of research areas and the faculty members associated with each area. Groups - A list of research groups with which faculty members are currently involved.